I know, I know, I am truly awful at this blogging malarkey. There are people out there who have the ability to churn out post after post of meaningful, interesting content, and do so on the hour every hour. Sadly, as I didn’t theme my blog ‘Interesting Photos Of Cats,’ “Ugliest Weddings’ or ‘Great Things To Do With Cake,’ I can’t just post photo after photo of weirdos and actually have to si t down and think about what I want to write before my fingers start making sweet, sweet love to the keyboard. Plus, now that I have a full-time job and am no longer sitting around waiting for my USCIS immigration paperwork to be processed, painfully in limbo while my Immigrant status moves from Pending to Nice and Legal, I don’t have the luxury of being able to squeeze in a dash of blogging between creating a culinary masterpiece for dinner, running Wifelet errands, bothering the cat and keeping the house tidy. I’m so glad I never got addicted to games like Farmville on Facebook otherwise I’d be going mental with the thought of my crops being left untended and withering away while I was at work unable to play. I’ve been so busy with work and being a Wifelet that I, a self confessed geek, allowed May the 4th to come and go without any sort of blogging homage to this, one of the geekiest days of the entire year. 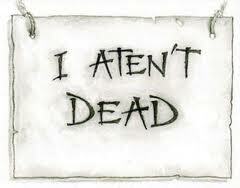 So, to quote the much feared and respected Granny Weatherwax, a literary creation from the Discworld series of books by one of my favourite authors, Terry Pratchett, “I Aten’t Dead.” Just ridiculously busy. Next Post Oh where oh where has Shahid Khan’s yacht gone? Oh where oh where can it be?